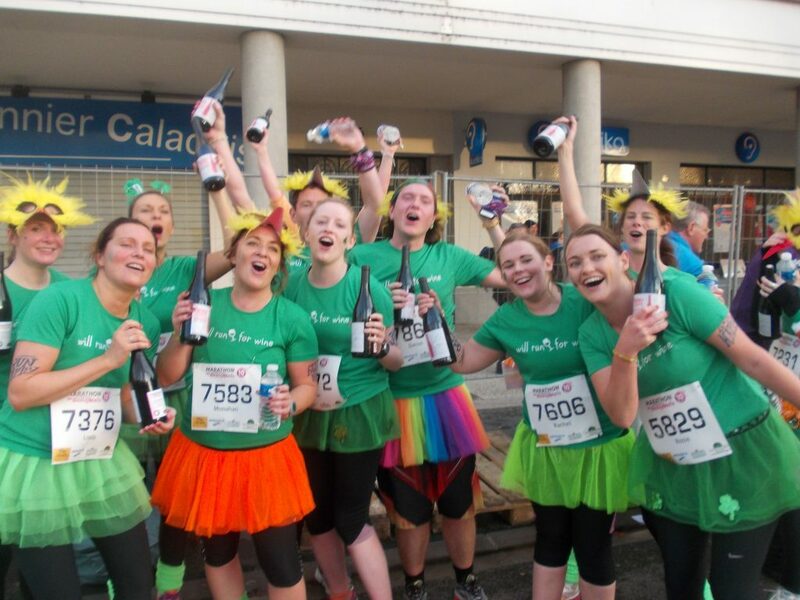 From the vineyard trail paths to the crowded rue Nationale at the finishline, the Marathon du Beaujolais is a spectacular of another kind. It never fails to surprise, to bring a smile to a face, to lift spirits and build friendships and motivation for another year of running. It’s a day that you dont want to end. It may be the slowest run, a ‘Personal Worst’ time (PW) as some of the running chicks christened it, but where else would you have so many wonderful memories of a run. Our annual trip to France reminds me that running is so much more than beating times or other people. Our memories are not of the time it takes, but the experiences we have along the way. It’s almost like the scenery, the people and maybe even the wine, carry us through the run and float us up to the finish line. It is important to soak up the atmosphere, take it all in, and be so grateful we can get out, travel, smile, dance, chat ‘in our best french’ and feel energised enough to sing and dance all evening. 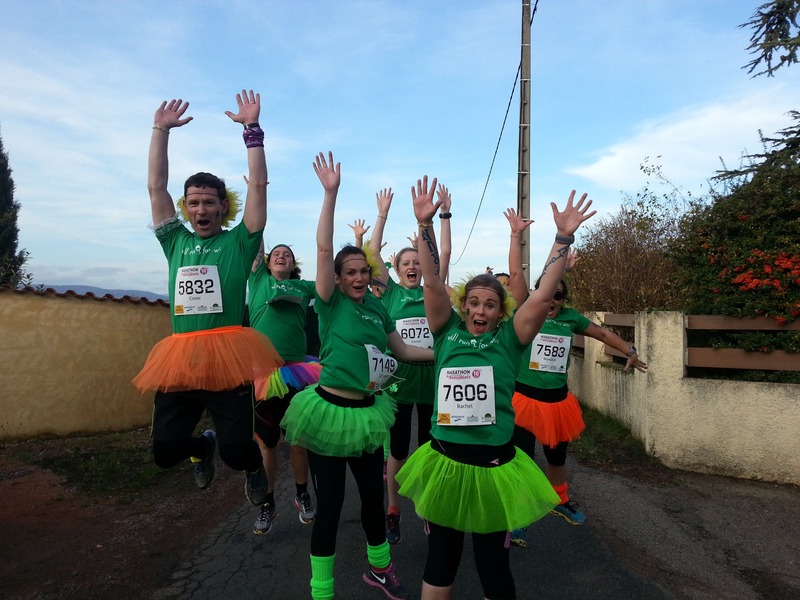 Marathon du Beaujolais – A full day out..
No matter which distance you run at Marathon du Beaujolais, the event is a full day out. 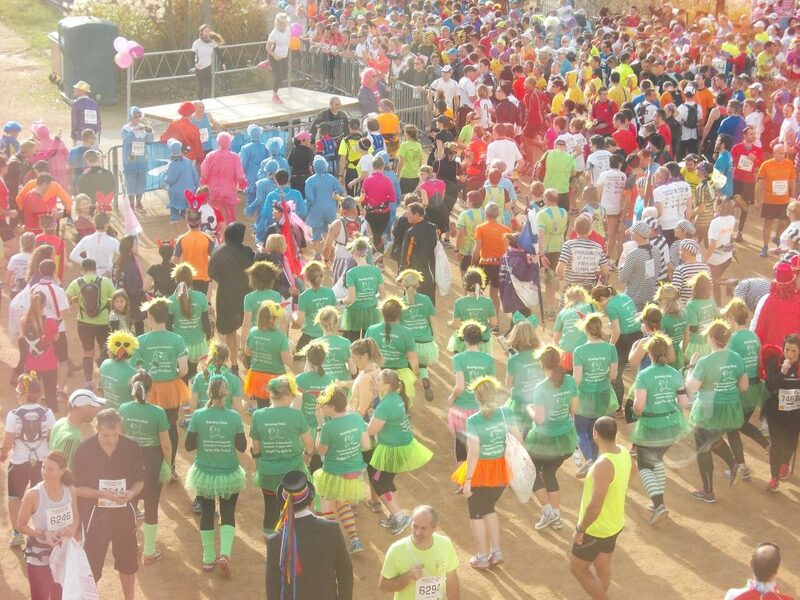 It starts with the race expo and number pickup, then the bus trip to the start line, the ‘official’ warmup and maybe even a petit glass of wine, and then the race gets under way. The event isn’t over at the finish line, the town stays alive all afternoon with fireworks, music and general wine fuelled good atmosphere. Each of my 5 trips to Beaujolais have been so memorable, and all a little different. It is such a pleasure to organise the weekend for our ForgetTheGym Students; they work so hard during the year keeping motivated and supporting eachother to get running and stay running. 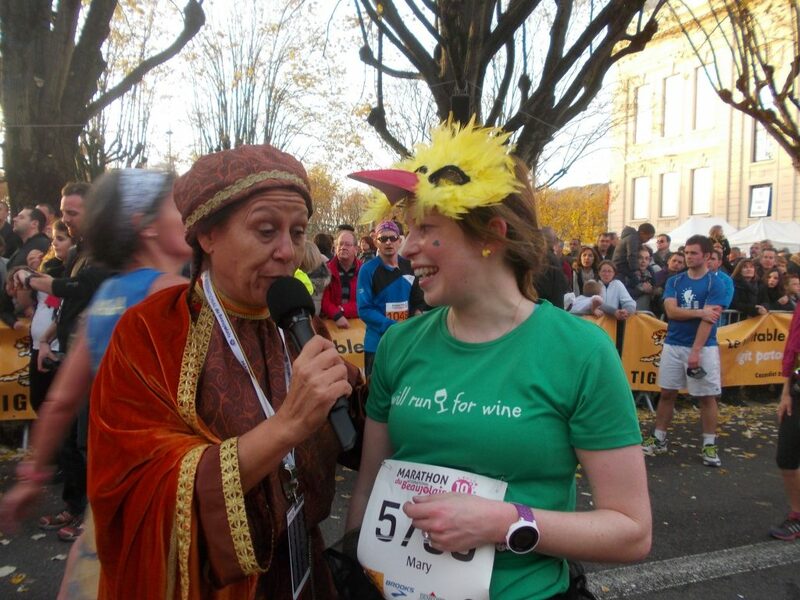 Arriving for my 5th year for the Marathon du Beaujolais, I wasn’t expecting too many new experiences from the weekend. Although one of our ForgetTheGym Annual highlights, I expected it to be very similar to previous adventures. How wrong was I. I’m not sure if it was the warm sunshine, the chicken masks, post run party or just 45 crazy irish that made for a day of non stop singing, laughing, dancing and even a bit of running. Whatever it was, this is a weekend in Beaujolais I will never forget. 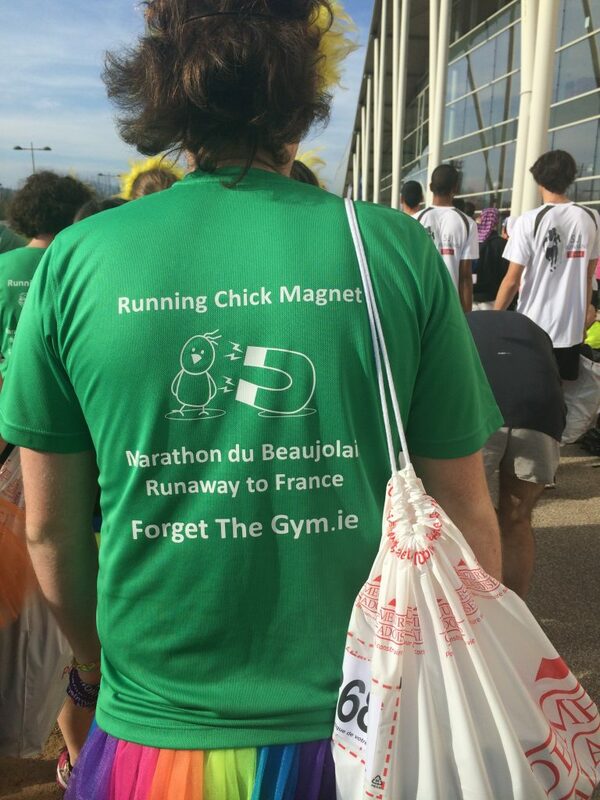 I love our ‘ Will run for Wine’ Tshirts, and this being the 3rd year for us to wear them, we need a little extra ‘je ne sais quoi’. Something simple, runable and light. At a race where the majority of people are in fancy dress, the addition of just a tutu is very tame. We needed something more. Sticking with the theme of running chicks, I took a chance and ordered 45 chicken masks. The masks were revealed at our pre race dinner on Friday night in Sixties Restaurant in Villefranche-Sur-Saone. In a word, they looked a little more scary than I had imagined. 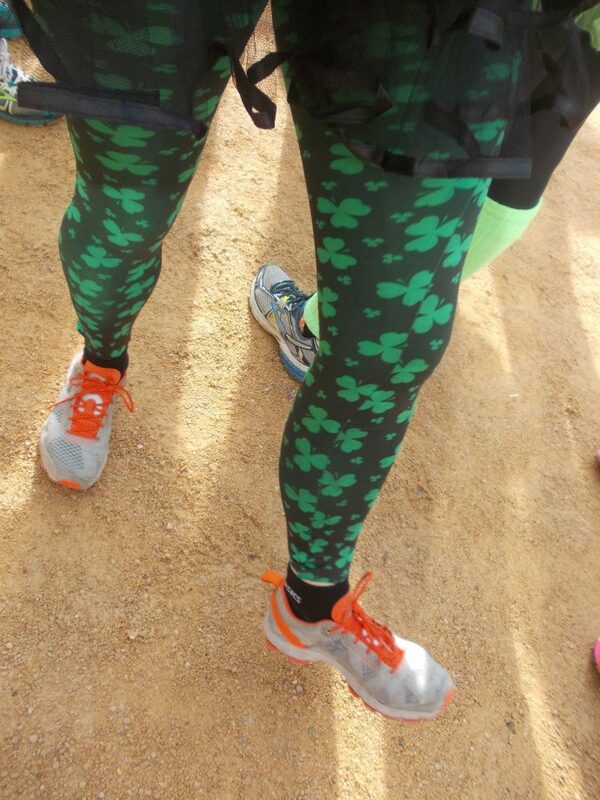 No going back now, once the experiment that wine could be drunk while wearing them was complete, they were now our official addition to the running chick costume. Although the half marathon took us on average about 1 hour longer than a ‘normal’ half marathon, the time seems to fly. It’s not the terrain or the hills that slow us down, its our inability to miss a picnic. Along the route, we stopped at every wine tasting, cheese and bread stall and our very favourite, the most wonderful BBQ in a private house along the route. Genuinely, it was a half marathon no one wanted to end. 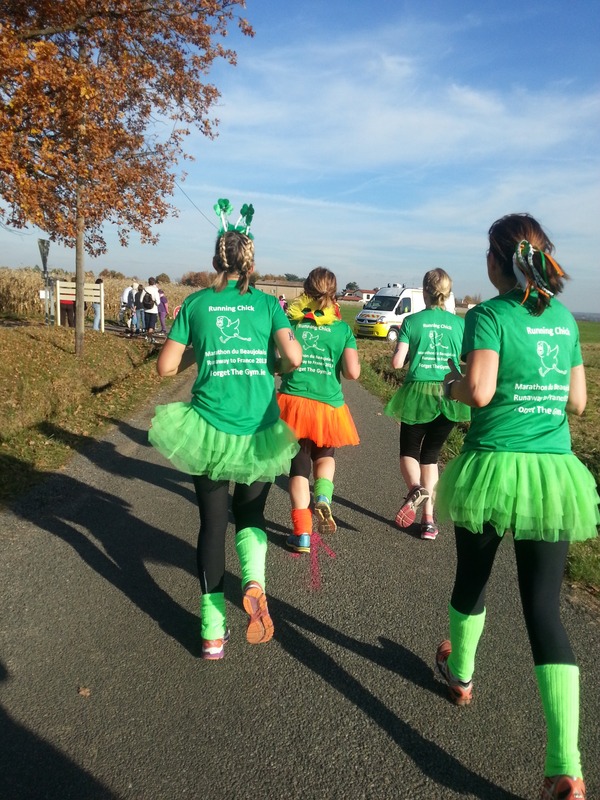 The sunshine was glorious, the atmposphere fantastic with fancy dress runners and supporters, scenery incredible and the music energetic, especially when the ‘birdie song’ was played as we ran past. This year the route was changed so the final mile went right downhill along rue Nationale, an incredible crowd cheering from both sides along the narrow road and swinging the final corners to finish by the townhall. For so many of the gang who had not experienced such a crowd at the end of a run, they truly felt they were winning. (that may have been the wine though). For me personally, the highlights of the weekend can be captured into 10 moments. Feeling like a tour guide/school teaching the airport bus looking back at 45 eager faces listening to my ‘instructions’. The post run singsong and dancing session at the bag collection point. Possibly the most fun evening ever. 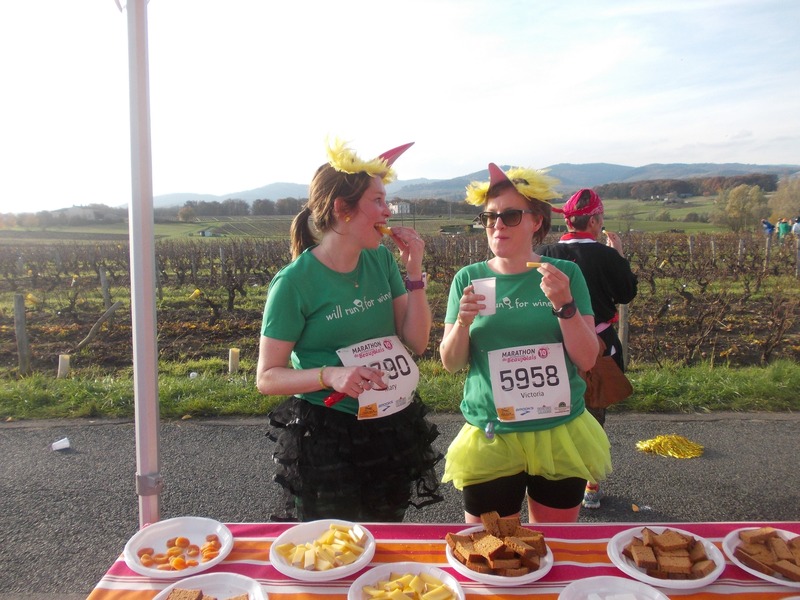 The best picnics – Nothing tastes better than wine and cheese and chocolate than at 19km of a run with the sun shining and the music playing. The weather and scenery, how could it fail to put you in a good mood. Spending a while the local wine producers St Julien ‘helping’ them sell their wine in the post run market. Sneaking into local shops for the most wonderful macaroons and chocolate the day before the race. 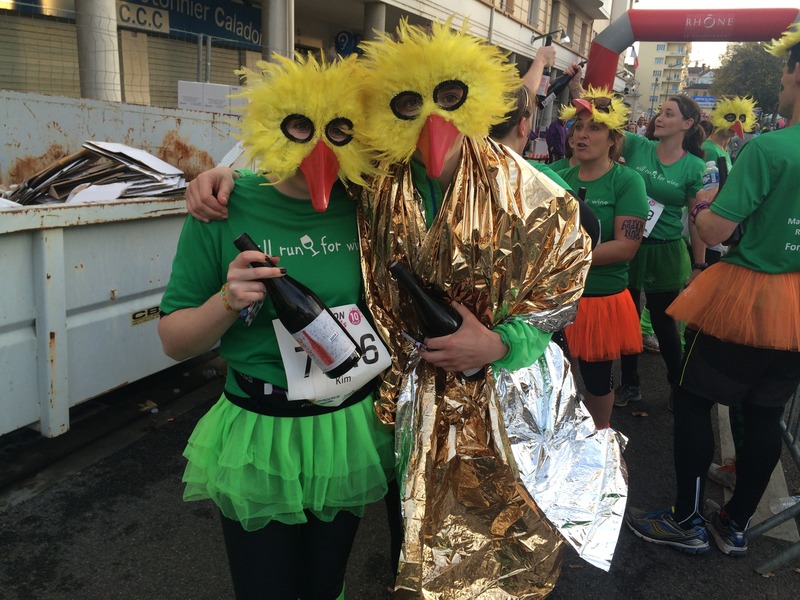 Each of our 45 runners has a different set of 10 best memories – thats the thing about Marathon du Beaujolais – there is so much going on, you cant possibly experience everything….. Thank you to all the organisers, volunteers, locals, runners and supporters. Special thanks to the folk at the half marathon bag drop for the entertainment, the vin chaud and the impromtu party. What a day to remember. What says it better than this little video..